A senior Welsh Brexiteer has said some UK government cabinet ministers do "not really believe" in Brexit, suggesting they should be replaced. 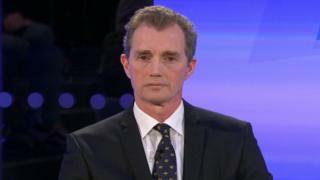 Monmouth Tory MP David Davies told a BBC One Wales Live debate the cabinet should be "full of people who believe that this country can govern itself". MPs again refused to pass Theresa May's Brexit deal last week. Welsh Government minister Jeremy Miles said the PM should have reached out to other parties from the start. In a Welsh Brexit debate broadcast on Sunday night, Mr Davies said: "I think that there is a problem that a lot of people in senior positions, some in cabinet, do not have that sense of optimism and confidence about it, and don't really believe in it. "When there's a reshuffle I hope the cabinet is going to be full of people who believe this country is going to be better off when we can make decisions ourselves." He added: "I want to see a cabinet full of people who believe that this country can govern itself, and we have the right to do so and that's what people have voted for." Last week in a series of votes MPs rejected Mrs May deal for a second time, voted to reject a no-deal Brexit and voted in favour of a delay. Under UK law Brexit is due to take place on 29 March, unless the EU agrees to move the date. Labour's Jeremy Miles, who speaks on Brexit for the Welsh Government, said: "When the referendum result was in... the prime minister should have, at that point, tried to find a cross-party view of what Brexit should look like, which respects the referendum result but commands support across the House of Commons. "The truth of the matter is she did not do that at that time. She ploughed on with a version of Brexit which, in her view, was good for the Conservative party and the DUP." "That strategy is not going to work," he added. The Brexit Party Wales MEP Nathan Gill, who was once UKIP Wales leader, said: "This is no longer a battle of will between Leave and Remain. This is a battle of will between the people's will and the Parliament's won't." "They spent 1,000 days doing everything they can to subvert your will, to stop what you told them very clearly what you wanted," he said. "You need to stop telling us what we voted for. We know what we voted for, it was to leave." Liz Saville Roberts, Plaid Cymru's Westminster leader, warned of a "divided society". After an audience member suggested pro-EU politicians might face the "wrath" of the public, Ms Saville Roberts said such language was a threat to democracy. She said some MPs were doing their best to come to an agreement, but she said: "Westminster is designed to be adversarial - it is failing miserably." "In this division that we find ourselves it does seem that democracy is the answer," she said, calling for a further referendum. Wales Live, BBC One Wales, 2230 GMT 17 March, or on iPlayer after broadcast.